This post was sponsored, but all views and opinions expressed are my own. I’m the first to admit that we lead a busy life. My family is always busy traveling, running errands, or dealing with school schedules. Because we lead a busy life, I have to stay organized. Skipping organization, as a busy family, is like forgetting to brush your teeth for a week. It makes you feel off. For those of you who are like me and want to keep your family organized in a busy world, these tips are for you! For me, I need everyone on board with organization before it works for us. My husband, daughter, and I all work together to stay organized. The key to getting the family involved is to communicate with each other. We talk to each other and ensure we’re on the same page. One of the biggest mistakes families make is always being in a rush. One way we stay organized around here is by allowing plenty of time to get where we’re going. Besides, being in a hurry makes everyone flustered and leaves me feeling disorganized. Allowing plenty of time means we stay much more organized, even with our busy lives. I know this seems like one more thing to do; however, it’s been a lifesaver for me! Writing things down has helped the whole family stay organized. The biggest perk to doing this task is I don’t overbook. A busy life often means we have several events on one day. Writing things down in my Busy Mama Planner helps keep my memory jogged. In 2018, we will be where we need to be because I took the time to write it down. Going from activity to activity can leave your family hungry. I never used to be the organized mom that had something on hand for my daughter to eat, but things have changed. 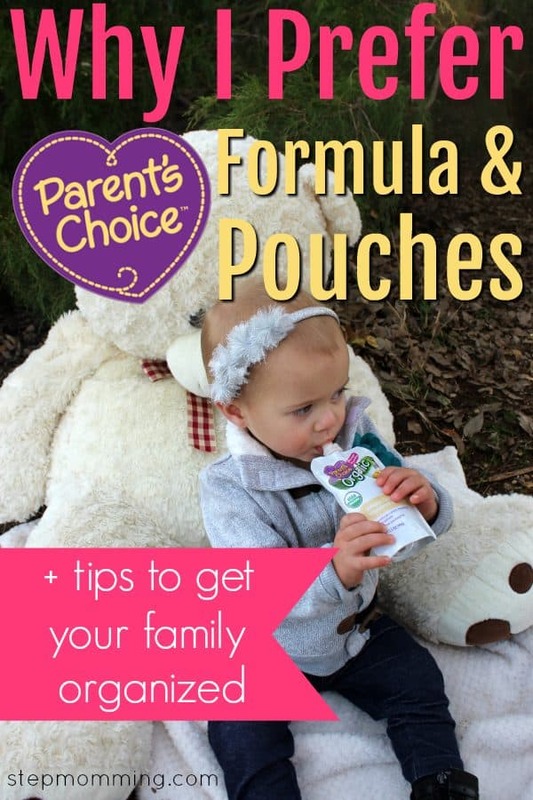 I LOVE keeping Parent’s Choice Food Pouches on hand when I have one of the little ones with me. I don’t have to rush home to figure out what to feed them. I keep the food pouches and the yogurt bites (These are still K’s favorite, and she’s 7 years old!) on hand, and everyone stays full and happy! There are many reasons I have been using Parent’s Choice for as long as I can remember. I have found that the quality of Parent’s Choice is top notch. 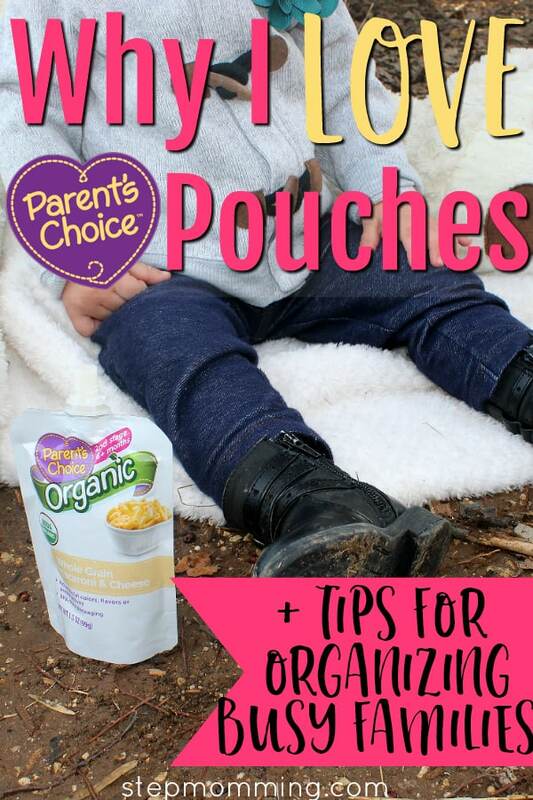 I am a huge proponent of saving money, and I can easily do that with the line of baby products Parent’s Choice offers. They have been a staple brand in homes for over 20 years. I can easily see why; I’ve never had an issue with a single Parent’s Choice item. Most importantly, our family loves the products and that makes everyone happy. I love buying our Parent’s Choice products in store, but you can also buy online (or buy online to pick up in store!). Purchase their awesome products in the way that works best for you. Be flexible, and the next time you find yourself feeling disorganized, I hope you’ll check out these tips and use what works for you. PLUS, their non-GMO formula will also be released by spring of 2018. PS: Parent’s Choice has over 275 products. Diapers, wipes, and every other essential you’ll need for your growing kiddo (they seriously have you covered).